ConfidentSend™ is the most comprehensive, user friendly and fast solution for removing hidden data & metadata from email attachments. 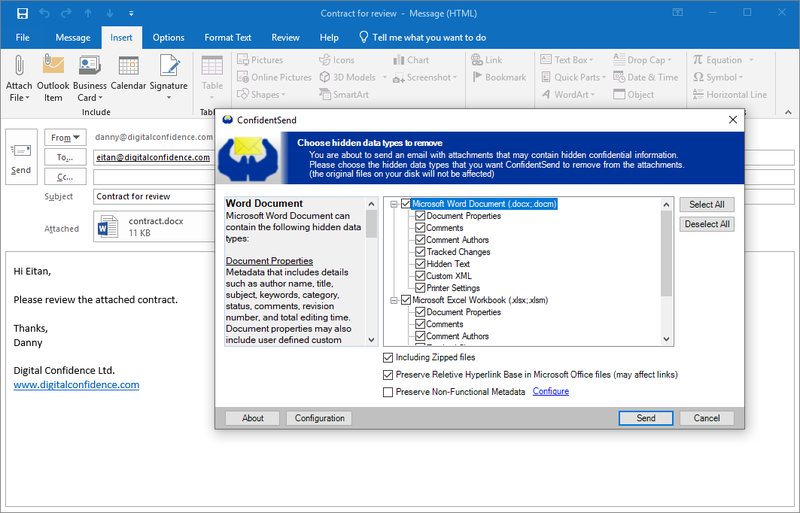 ConfidentSend™ can remove hidden data from Microsoft Office® documents (Word, Excel, PowerPoint)*, OpenOffice™ documents, PDF documents, and popular image and media file types such as JPEG, PNG, and SVG. ConfidentSend™ can remove hidden data from files even if they are compressed within ZIP files. ConfidentSend™ seamlessly integrates with Microsoft Outlook® or with Mozilla Thunderbird™ email clients, inspects and cleans the attachments of each and every outgoing email. ConfidentSend™ also warns the user when sensitive content is found in the email message and its attachments. With ConfidentSend™ you can free yourself and your organization from the worry of unintentional sensitive data leakage through the hidden data stored in email attachments.